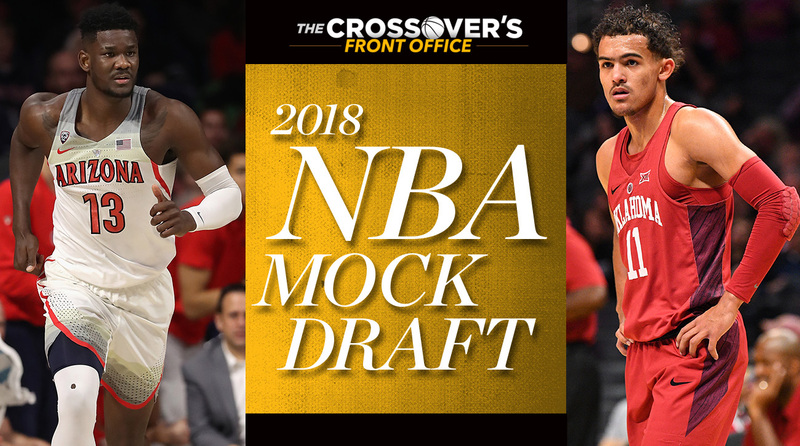 In our latest NBA Mock Draft, Trae Young continues to climb up the board, DeAndre Ayton holds steady at No. 1 and Collin Sexton tumbles out of the top 10. With the passing of the trade deadline, it’s fair game to start looking at rosters and assessing team needs as the draft nears. With that in mind, it’s a good opportunity to revisit the first round after some picks have changed hands and as the college season winds to a close. As it stands, there’s a great group of players atop the draft that have established themselves as top prospects. And that aside, first-round picks are especially valuable this season, as evidenced by teams’ hesitance to part with them. Only the Cavs and Pelicans moved first-rounders before the deadline, and both were operating with degrees of desperation. Given the large number of teams still fighting (tanking?) it out at the bottom of the standings, there was added downside to moving a likely lottery pick. And as it stands, there are eight teams sitting between 17 and 19 wins, all with a real chance to end up picking in the top three save for the Nets, whose pick will go to the Cavs. As far as the deadline was concerned, the upcoming salary crunch facing most teams added value to the safety of the locked-in, guaranteed cap number of a rookie contract. So even if this year’s draft ends up as top-heavy as it seems, it will still be worthwhile as ever to take big swings late in the first round, quality of the draft aside. Depth is a factor more easily determined later in the process once prospects can be taken out of their team environments and placed into better contexts. And of course, there’s still tournament season to leave a lasting impression on scouts. As always, the aim of our mocks is to project what the first round of the draft might look like if the season ended today, based on team needs and which players are trending. Teams are sequenced in the reverse order of current standings, with traded picks and protections considered. Last updated Feb. 12. 1. Kings | DeAndre Ayton, C, Arizona | Fr. Although the Kings have a number of bigs on the roster, it shouldn’t preclude them from selecting the best player available. Luka Doncic would receive heavy consideration here, but Ayton’s star potential, tantalizing athletic ability and floor-spacing promise will be hard to pass up. From a physical standpoint, Ayton is an extremely rare prospect, as strong and agile as any seven-footer in recent memory. One scout I spoke with this week likened his athleticism to Patrick Ewing at this same stage. With his burgeoning offensive skill level, he can be as dominant as he wants to be. Defensively he’s been inconsistent, but has improved over the course of the season and has the tools to be impactful once he gets up to speed. He remains the top prospect on SI’s Big Board. The Hawks aren’t tied down to much of anything on their roster beyond John Collins, and are in search of a foundational player. Doncic’s talent is no secret, and he’d be able to take over the offense right away. With his ability to read the floor and see over defenses, he’ll be able to make others better and benefit from additional space to operate. The question is whether you see Doncic as your franchise player long-term, or project him more as your second or third-best guy. His ceiling will be tied to his individual shot creation (and whether he can shoulder a superstar’s workload), or if he’s best-suited playing off a star teammate at the NBA level. He’s a safe bet to produce great value among the top picks and won’t fall far, if at all. 3. Suns | Mohamed Bamba, C, Texas | Fr. The Suns appeared to address their point guard issues by adding Elfrid Payton at the deadline. Until that experiment resolves itself, Phoenix can focus on adding to its frontcourt, with center being the biggest need. There’s no question that Bamba has insane defensive potential with his length and mobility, and he’d be an ideal complement to a scoring-minded core group headlined by Devin Booker. He may not need to max himself out offensively to be an immensely valuable player, but has shown potential shooting jumpers and is a marvel to watch when he’s on. The chief concerns I’ve heard from league personnel center on Bamba’s motor, and how badly he wants to compete at times. If he can lift Texas to the NCAA tournament and plays well, he can answer those questions. 4. Mavericks | Marvin Bagley III, F/C, Duke | Fr. After hitting on Dennis Smith last year, Dallas will be well-positioned to complement him atop the draft. Bagley’s long-term potential and high-energy rebounding makes him a nice fit, and he could potentially spend time at center with Harrison Barnes at the four in smaller lineups. His production has tailed off a tiny bit in concert with Duke’s mid-season doldrums, and there are some questions about his positional fit, particularly tied to his defensive issues. That said, he’s still at an early stage of his development and couples appealing physical tools with elite college production. With shooting around him and more space to operate inside, he’ll be better positioned to utilize his mismatch. Bagley may not be as prepared for the NBA as some expected coming into the season, but as he learns and adapts in the years to come, he could become a dangerous, dynamic player. 5. Grizzlies | Michael Porter Jr., F, Missouri | Fr. Memphis’s refusal to entertain Marc Gasol trades indicates the Grizzlies are aiming to be competitive when Mike Conley returns. There may not be an instant fix, but gambling on Porter, who might be the best scorer in the draft, could be a meaningful risk/reward move and terrific fit for a franchise long in need of a high-level wing. Porter says he intends to return from back surgery before the end of the season, which would be a risky choice as it pertains to his long-term health, much less his draft stock. But as long as his medicals check out, his size, shooting and polished game should keep him pretty safely among the draft’s early selections. 6. Magic | Trae Young, PG, Oklahoma | Fr. Expect the Magic to lean toward long-term upside wherever they select. There’s a definite hole at point guard, and Young deserves consideration should he fall to them. There’s mixed opinion surrounding his long-term prospects, but he comes with star-level potential if everything breaks right, able to rain threes from deep, utilize high ball screens and find teammates. Defense will always be an issue given he’s physically slight, but in a spread attack with the right personnel, Young can still thrive. Pairing him with Jonathan Isaac would be a step in the right direction. 7. Cavaliers* | Jaren Jackson Jr., C, Michigan State | Fr. Amid the flurry of deadline moves Cleveland made, they were wise to hang on to the Brooklyn pick, which is set to land in a desirable range and produce something useful. Jackson’s two-way potential has been evident all season. He’s one of the youngest players in the class and perhaps not ready to make a big impact from day one, but has the sort of skill set that fits in safely on most teams. He can space the floor, protect the rim and occasionally switch onto wings, but is still learning to make his impact felt consistently. Jackson would be a nice piece for the Cavs whether LeBron stays or goes. 8. Bulls | Wendell Carter Jr., C, Duke | Fr. Expect the Bulls to focus on the frontcourt in this range and find a player who fits with Lauri Markkanen. Carter is viewed by scouts as a well-rounded prospect, and his high skill level and IQ make him a nice piece. Marvin Bagley has been more hyped but Carter has arguably been Duke’s best player, and certainly its most consistent performer. He’s a terrific rebounder and versatile offensive player who should be able to add consistent three-point range to his game. His star upside could be limited by a lack of elite lift, but he’s certainly athletic enough to make his game work in the NBA. He’s established himself as a potential Top 10 selection with his play. 9. Knicks | Kevin Knox, F, Kentucky | Fr. The Knicks’ biggest area of need is on the the wing, where they could use a versatile player to complement Kristaps Porzingis and Frank Ntilikina. An upside play makes sense with the timeline of their core, and Knox’s scoring ability, three-point shooting potential and ability to play either forward spot makes him a projectable fit. He’s made noticeable strides over the course of the season, particularly with his on-court approach, and has a lot of room to grow as he develops his ball-handling, works on his body and starts to unlock his versatility. 10. Hornets | Mikal Bridges, SF, Villanova | Jr.
Charlotte won’t have to make a need-based pick here, and although the Hornets sat tight with their top guys at the deadline, it’s conceivable they get active again come draft time. With Kemba Walker still in place and Malik Monk just a season in, the wing could be the area most worth addressing. Bridges brings high-level college experience and a valuable 3-and-D skill set, with more offensive upside than Michael Kidd-Gilchrist and a considerably high overall floor as the Hornets try and chart their next direction. His ability to space the floor and play in transition would be an instant boost. 11. 76ers* | Lonnie Walker, SG, Miami | Fr. As Philadelphia rounds out the team around Joel Embiid and Ben Simmons, adding a scorer with upside on the wing like Walker could be an ideal addition. With Bruce Brown injured, Walker has begun to turn it on in recent weeks and has high-end physical attributes that endear him to scouts. He’s a slasher with a streaky but potent three-ball and nice upside in the late lottery. Areas of improvement for Walker include commitment to defense and learning to become a threat off the ball. He wouldn’t be rushed to contribute in Philly. 12. Clippers* | Miles Bridges, F, Michigan State | So. Bridges has taken some flak this season, but brings athleticism, toughness and some shot-making ability on the wing, with potential to become a plus 3-and-D guy in the right situation. He checks the intangible boxes the Clippers are looking for, and can ease into a role early on. Bridges’ struggles to attack off the dribble and lack of ideal measurables could be indicative of some long-term problems, but at the back end of the lottery he makes sense given the things he does do well. 13. Jazz | Collin Sexton, PG, Alabama | Fr. The Jazz are building around Donovan Mitchell, Rudy Gobert and Joe Ingles and could address a few different needs in this range. Sexton’s slashing ability and potential to be a solid defender could make him an ideal partner for Mitchell, giving the Jazz a pair of athletic playmakers who can operate with or without the ball and work off each other. He’d be a good fit with Utah’s defense-oriented philosophy and give them a third guard to rotate in as Ricky Rubio’s eventual successor. 14. Clippers | Robert Williams, C, Texas A&M | So. It’s unclear at this stage what DeAndre Jordan’s fate might be, but Williams’ elite strength and leaping ability make him an intriguing upside play in the middle regardless. He will need to be coached up and probably require some patience, but he’s physically ready to compete in the league. Playing hard on a consistent basis will be requisite, but scouts are aware of what he can do at his best, and in a simplified role he can become a useful contributor. 15. Bulls* | Troy Brown, G/F, Oregon | Fr. The Bulls are set to pick twice in the first round after acquiring this pick from the Pelicans in the Nikola Mirotic deal, and might be positioned to add depth on the wing. Brown has come on strong for Oregon and possesses an enviable, well-rounded perimeter skill set that should play on most teams. He’s plenty athletic, with some playmaking ability and comfort handling the ball. Brown’s length and quickness helps generate turnovers, and gives him enticing 3-and-D potential. For the Bulls, he’d be a great piece to add to a talented young group. 16. 76ers | Chandler Hutchison, G/F, Boise State | Sr.
Hutchison’s experience level could give Philly some immediate help on the wing. He’s having an outstanding season as the lead man for Boise State, and could really thrive on both ends of the ball when placed onto a team where he can play off of other guys. He has nice size and tools, can make crafty cuts without the ball and would get plenty of looks operating alongside Ben Simmons and Joel Embiid. Hutchison is a savvy player who fits the Sixers’ style nicely. Denver loves international players and could use some size and scoring on the wing, with Wilson Chandler on the way out and Will Barton headed for free agency. Musa fits that bill nicely, and brings a degree of competitiveness and smarts that would fit well with the Nuggets’ young group. He’d have to operate off the ball more than he’s used to, but could shine as another perimeter threat around Nikola Jokic. 18. Suns* | Shai Gilgeous-Alexander, PG, Kentucky | Fr. This early in the draft Gilgeous-Alexander comes with some added risk, but his skill set is a great theoretical fit with Devin Booker and he’d give Phoenix another ball-handler and setup man. As he fills out, his size, length and instincts should allow him to defend the opponent’s top backcourt scorer. He’s an unselfish player who has emerged as a floor leader for Kentucky. His long-term shooting potential begs some question, but Gilgeous-Alexander has been impressive overall and should be a worth a shot as a long-term play. 19. Trail Blazers | Daniel Gafford, C, Arkansas | Fr. Though Portland remains invested in Zach Collins, at this stage of the draft Gafford’s physical potential might be too much to pass up as a long-term project. The Blazers’ crowded cap sheet skews heavily toward perimeter players, and given the overall dearth of NBA-ready bigs in this class, Gafford is a good first-round dice roll. When he’s active, he’s a constant threat to catch lobs and block shots, and he has freakish bounce for a guy his size. He’s the type of player who will excel in workouts and sniff late lottery range just on upside. 20. Pacers | Anfernee Simons, G, IMG Academy | HS Sr.
Simons continues to explore the possibility of attending college next season, but all signs indicate he will test the waters this spring before making a decision. He’s got a lot of intriguing traits, with high-level explosiveness, great foot speed and developing three-point range. Simons may not be a true point guard, but should be able to handle some level of ball-handling duties in time. He’s obviously far from a finished product and will need G-League time to gain experience in addition to a lot of time in the weight room. 21. Timberwolves* | Bruce Brown, G, Miami | So. It’s been a disappointing season for Brown, who continues to recover from foot surgery. He hasn’t made the requisite type of strides you’d like to see from a 21-year-old sophomore, regressing as a shooter and profiling more as a combo guard than a point. Still, his gritty defense and athleticism are strong points, Minnesota is aiming to win sooner than later, and Brown feels like a Tom Thibodeau guy with his no-frills approach. This might be a situation where his skills could be maximized. Milwaukee continues to search for a center who can properly complement Giannis Antetokounmpo. While there’s no perfect fit available, Robinson’s upside as a rim-runner and paint protector could make him worth a shot here. He’s perceived as a high-risk pick after sitting out the college season, and has one of the widest ranges in the draft. The success of a guy like Jarrett Allen in a similar role in Brooklyn this season may be a blueprint for easing Robinson into the league. His best-case scenario is first-round caliber. 23. Wizards | Shake Milton, G, SMU | Jr.
Finding useful backcourt depth behind John Wall and Bradley Beal has been a bit of a challenge for the Wizards, and they should end up in a good draft range to address that need. Milton’s size, unselfishness and shooting ability could make him a nice fit as a third guard. He’s better playing with the ball in his hands, but he’s smooth and experienced and could thrive when not tasked with carrying an offense. Milton has missed a couple of weeks with a hand injury, but doesn’t have much left to prove at the college level. 24. Hawks* | Rawle Alkins, G/F, Arizona | So. Although he’s missed time on and off with a foot injury, Alkins has been an X-factor for Arizona all season and looks to be rounding into form for the stretch run. His ability to slash and shoot from outside and keep up with opposing wings defensively would be a nice fit with Atlanta’s rebuild. Alkins is an intelligent player and has some scoring upside thanks to his strong build and explosive leaping ability. He can gather some steam with a strong finish to the season. 25. Lakers* | Brandon McCoy, C, UNLV | Fr. The Lakers have cleared the deck to pursue top free agents this summer, and acquiring this pick from the Cavs at the deadline was somewhat of a coup. They can angle for a future contributor in this spot, and will be in need of frontcourt help given the likelihood of Brook Lopez’s departure. McCoy isn’t NBA-ready, but has the physical ability to become a competent rotational center and has produced impressively for UNLV. The Lakers can put shooting around him and try to turn him into a useful screener and interior defender. 26. Spurs | Jontay Porter, C, Missouri | Fr. Though Porter is best served staying at Mizzou to work on his body and interior game, he’d have a case in the late first round this year. He’s demonstrated a uniquely high-IQ game for a center, and can step out and shoot threes as well as craftily attack the basket on closeouts. Porter reclassified to play alongside his brother this season and has a lot of learning to do, but his instincts for passing and positioning would be a nice long-term fit for the Spurs’ system. He’s a gamble they can afford. 27. Celtics | Khyri Thomas, SG, Creighton | Jr.
A new deal for Marcus Smart could potentially push Boston close or into the luxury tax. Taking another defensive-minded guard in Thomas could be a reasonable alternative. He’s been solid for Creighton this season and emerged as one of the better on-ball defenders in college basketball while hitting threes at a strong clip on the other side of the ball. He’s not a player with crazy upside, but has a chance to fit into a valuable role archetype in someone’s backcourt. 28. Nets* | Hamidou Diallo, SG, Kentucky | Fr. Diallo was tied to the Nets last year before pulling out of the draft, and has definite untapped potential as one of the best pure athletes available. His role at Kentucky has diminished of late, and there are relevant questions about his ability to be effective in the halfcourt. He hasn’t helped himself this season, but at this point in the draft, he’s still worth a dice roll. Diallo certainly fits with Brooklyn’s development philosophy. 29. Hawks* | Trevon Duval, PG, Duke | Fr. Though Duval has had his struggles this season at Duke, there have been glimpses of the ability he showed in high school. It’s been well-documented that he can’t really shoot jumpers, but he well-rounded enough to remain in the first-round picture. He’s athletic and can get downhill and make plays, but is still learning to run a team. The Hawks will have three first-rounders, and he could be a nice upside play in this range, particularly given the team doesn’t seem tied down to Dennis Schröder. 30. Warriors | Landry Shamet, PG, Wichita State | So. Shamet’s size, unselfishness and ability to shoot from distance would be a nice match with the Warriors, who might be priced out of retaining Pat McCaw in restricted free agency. He can be a threat on and off the ball and wouldn’t be tasked with creating too much of his own offense as a member of the Warriors. His smarts and impressive numbers from outside make him an obvious fit here.